In Color Order: April Sale: Paper Patterns! Happy Monday! During the month of April, I'm doing a bit of Spring cleaning in my shop (incolororder.bigcartel.com)! Each Monday in April, I'll be announcing a new sale. The sale will run from Monday to the following Sunday! This week, I'm holding a sale on paper patterns! All full-size patterns are $2 off, and postcard patterns are $1 off! The sale is good through April 24th. As an added bonus, I'll be including an extra goody in all sale orders! A paper pattern, George button, or maybe even some fabric! Prices have been adjusted, no coupon code needed. While supplies last. 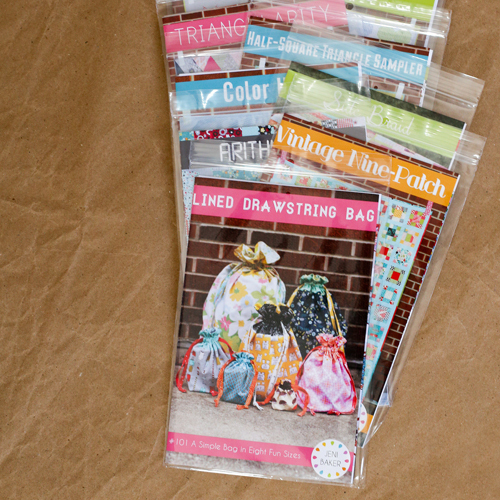 Hello Jeni, I would have loved to buy a Side Braid paper pattern from you (I already own - and love- the PDF pattern for the lined drawstring bags, bought back in the days!) just to get "snail mail" from the States! But on your system it says "no shipping of this paper pattern to France". It's understandable, I guess: if shipping costs as much as the pattern, there is not much point ... Are your paper patterns for sale anywhere in Europe? I haven't bought any PDFs from outside Europe since the changes to the EU legislation, I'm afraid. Thanks for sharing your quilts, bags and ideas on the blog and for offering so much inspiration.